Samsung sneaks out 7in Galaxy Tab 2 tablet | What Hi-Fi? Samsung has launched a new tablet, the Galaxy Tab 2 (7.0 ). The 7in device is powered by Android 4.0, aka Ice Cream Sandwich, and is set for an imminent launch in the UK. Available in 3G and WiFi versions, the tablet claims faster response times, an improved interface and better web browsing compared to previous Samsung tablets. The Galaxy Tab 2 was announced at Samsung's European Forum in Prague, giving Samsung the jump on rivals who are set to announce smartphones and tablets at Mobile World Congress in Barcelona next month. Apple is also rumoured to be readying a 7in iPad, which could launch alongside the 'iPad 3' in March. As well as access to the Android Market for apps, the Galaxy Tab 2 will have Samsung's Video Hub for buying or renting movies plus the company's own social networking hub, ChatON. It has a 1026 x 600 resolution LCD screen, a 1GHz dual core processor and 1GB of RAM, plus Bluetooth connectivity. 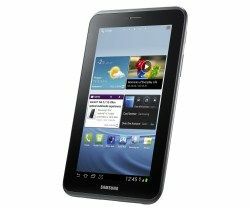 Due out any day in the UK, the Samsung Galaxy Tab 2 (7.0 ) will launch across Europe in March. No word on price but it looks set to be pitched at the more affordable end of the market.